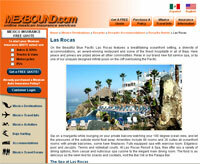 Mexbound.com believes that what a company stands for is as important as what it produces. We provide our customers with numerous ways of obtaining information and providing us with their own feedback. We encourage customers to contact us with their comments, suggestions, stories or news tips. If you have any questions regarding coverage, policy details or information on your mexico insurance policy please feel free to contact us at the toll free number listed below to speak with a live agent. If you have any Mexico related tales, photos, comments or news regarding the operation of this web site ONLY, please send an email to info@sanbornsinsurance.com.